The implementation of module-level data communication is the premise of achieving smart solar energy. 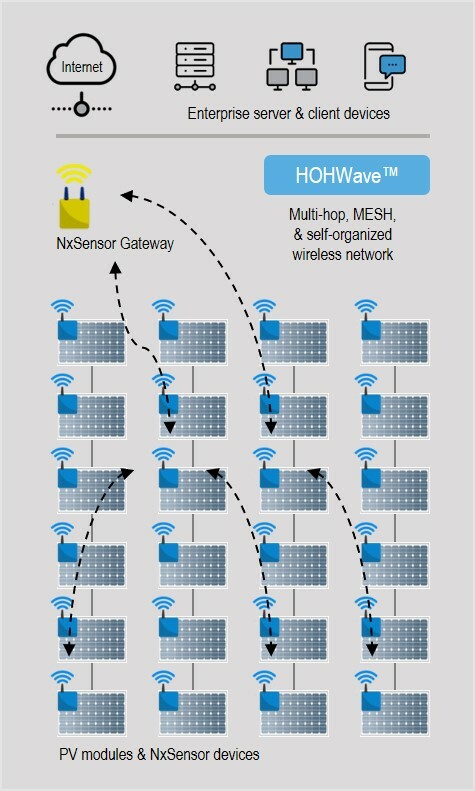 The NxSensor system adopts a wireless mesh network - HOHWave™. It is explicitly designed for wireless sensor network of high density and large area, just like the case of PV module-level monitoring. 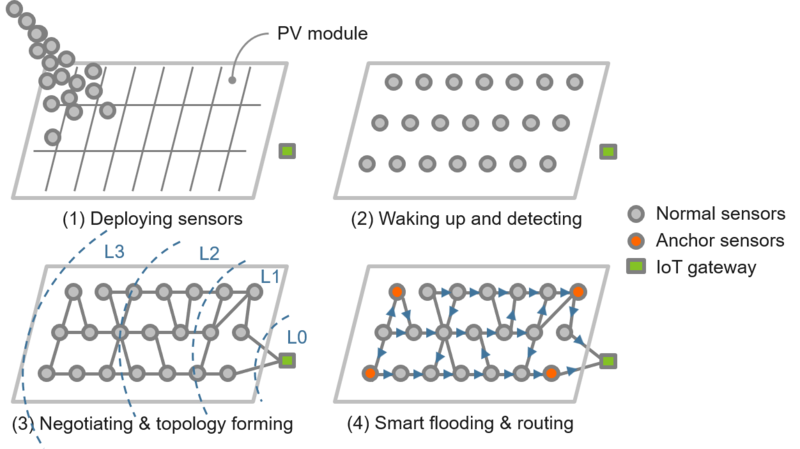 Being a great substitute of conventional communication technologies in solar industry like ZigBee, or power line communication, it offers advantages like self-organization, multi-hop, flexibility, ease of use and reliability, making it capable for extensive PV assets measurements and event alerts. For PLC (Power Line Communication), it needs to deploy a data reader on each string to receive data sent from each individual PV module, that increases the cost and results in an overall high-price solution. For ZigBee, the number of sensors that a network can access or accommodate is usually less than 300 nodes. For solar energy, an application of 300 PV modules is only considered to be a very small system. So solutions based on ZigBee are limited by the difficulty to expand their network capacity. After the HOHWave™ network starts to work, a sensor broadcasts its status to the surroundings and receives messages from others. After a while, all the sensors in the network could detect each other and know the neighbors. Next, the network forms into a hierarchical structure, for example, the gateway has the smallest level index, aka, level 0; the sensors within the gateway's signal coverage are the level 1; the sensors in the outside rings but within level 1's signal coverage are the level 2. Eventually, every sensor in the network has its level index. Regarding the data transmission, it could be made by flooding or routing strategies. 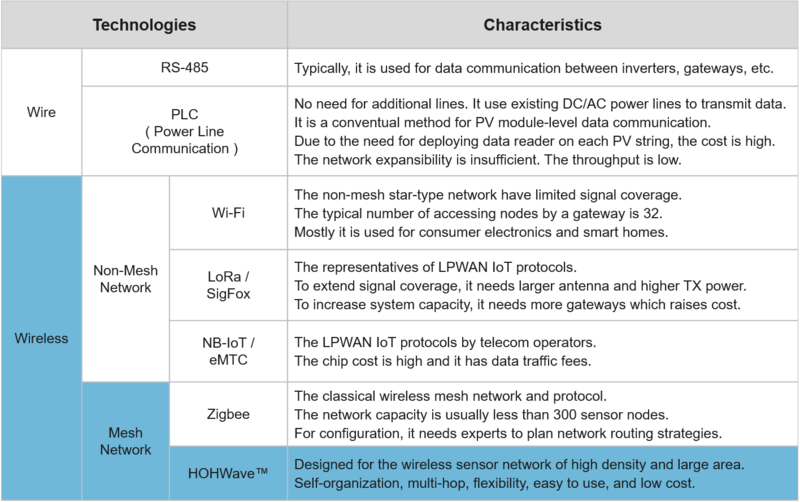 In HOHWave™ network, the data transmission path between one sensor and the gateway is not singular or fixed, which makes the network more robust and require less manual configuration. This is the biggest advantage of HOHWave™ network if compared with ZigBee solution. One biggest advantage is that you could put the gateway almost anyway in the PV plant. In the HOHWave™ network, the gateway doesn't require to be put in the center of the PV arrays or to be mounted at a high pole. That all ease the job of system installation and set up. Self-organization, multi-hop, flexibility, ease of use and reliability.